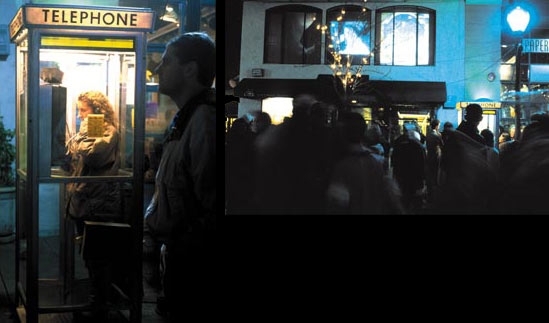 We invited viewers to enter the phone booth that served as the interface to 3 prominent second story windows. A voice mail system presented a menu of questions to participants while a surveillance video camera captured their images. Upstairs computers, projectors, and crew created a feedback system whereby participants and their words were randomly projected onto the windows. This piece communicated the New Years’ Eve collective consciousness of Santa Cruz, CA to the viewing public.